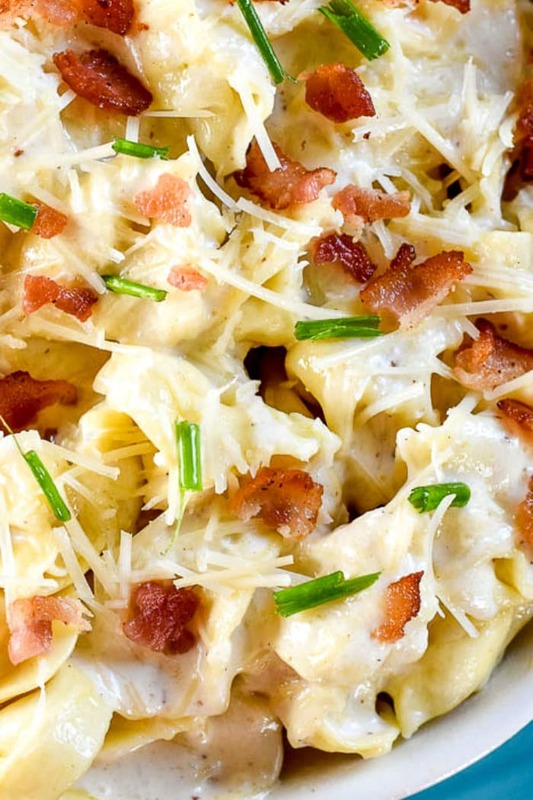 This Tortellini Al Forno, a copycat Olive Garden recipe, has pillowy cheese filled tortellini in a rich parmesan cream sauce with crumbled bacon and chives. I loved the Tortellini Al Forno dish at Olive Garden. It was on their small plates menu, which made it an appetizer-sized dish. However, last time I went there it was not on the menu! The horror! LOL! That’s when I knew I had to make this tortellini recipe! We love that dish, and since Olive Garden didn’t have it on their menu, it was time for me to make my own version of it so we can enjoy Tortellini Al Forno at home. I wish I could capture the incredible flavor of this Tortellini Al Forno, especially the rich, creamy parmesan cream sauce, and send it digitally to the computer to you so you could experience it. It just makes me melt into a puddle of giddiness. Is there such a thing? There is now thanks to this Tortellini Al Forno. Actually, for a limited time, Olive Garden brought back the Tortellini Al Forno. However, after tasting their dish and comparing it to this recipe, there is no comparison. This recipe is my favorite hands down over Olive Garden. Sorry, Olive Garden. What Is Tortellini Al Forno? Their menu said it was made with a cheese and prosciutto-filled tortellini. If you can find that specific type of tortellini, good for you. I could not find it in our local grocery store, and it is a big store. So I used 3-cheese tortellini and added bacon to the recipe. So it is not exactly the Olive Garden version but it is close and is still absolutely fabulous. What Does Al Forno Mean? Al Forno is a food that has been baked in an oven. I assume Olive Garden named it this because they bake theirs in the oven. However, in my opinion, my version did not need to be baked, unless you wanted to melt more cheese on top. What Makes Tortellini Al Forno Taste So Good? One thing I did to add incredible flavor is to make the sauce in the same pan as I cooked the bacon. You know what that means, don’t you? 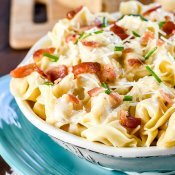 I had a rich, creamy parmesan sauce infused with incredible bacon flavor. Yum! If you want a pillowy cheese tortellini covered in a rich, creamy, bacony parmesan sauce, then this is your recipe. 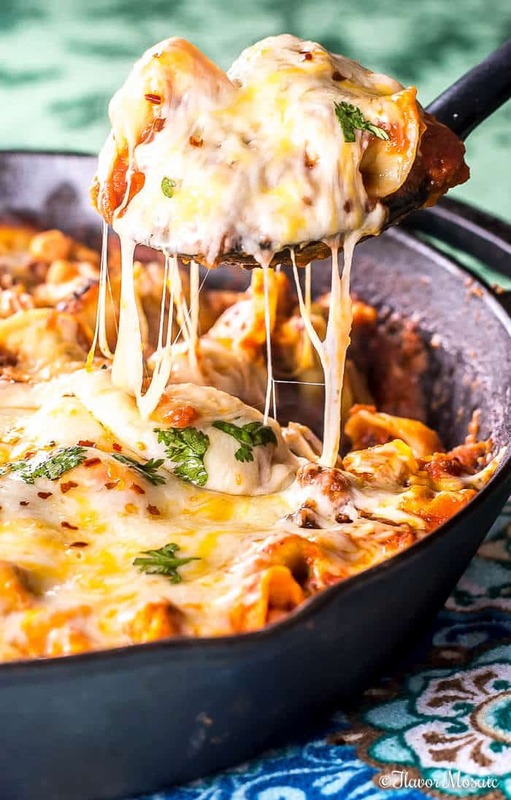 Your family will go quiet because they will be so busy enjoying this Tortellini Al Forno. Don’t wait. 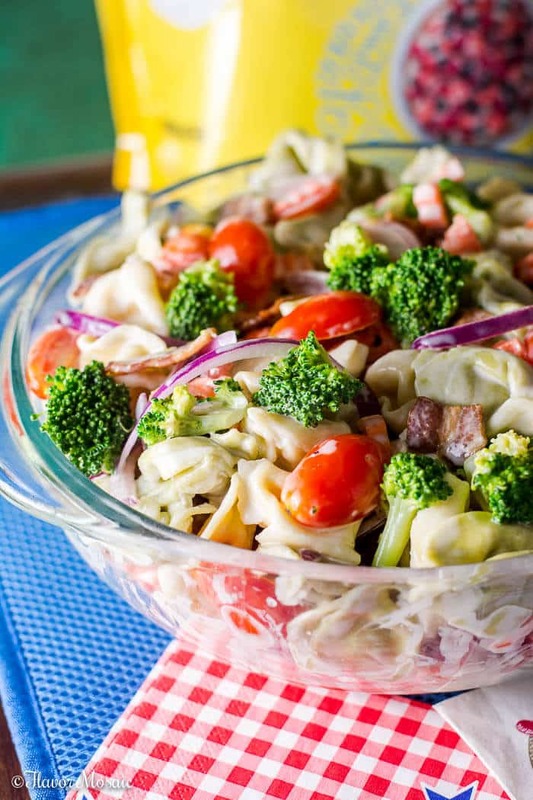 Hurry to the grocery store to pick up the ingredients to make this amazing Tortellini Al Forno. You will thank me later. 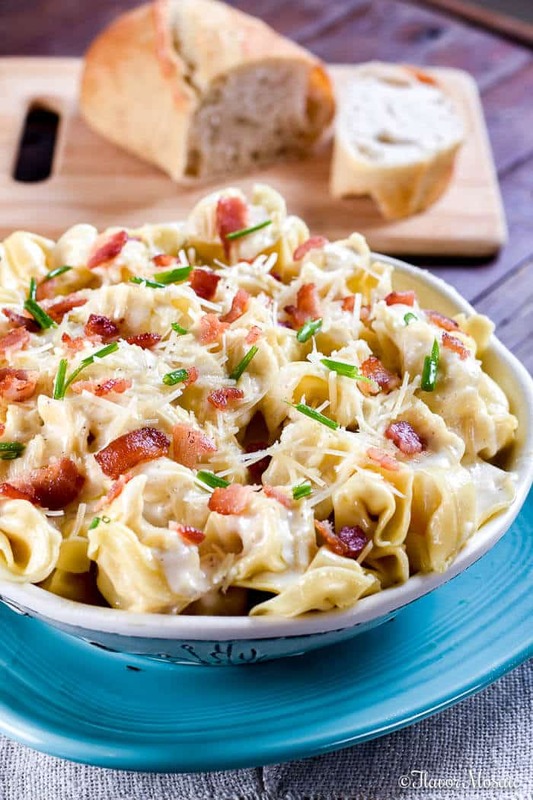 Don’t worry if you can’t find cheese and prosciutto tortellini, pick up 3 cheese tortellini or the closest tortellini you can find to the cheese and prosciutto tortellini. What Ingredients are Used in Tortellini Al Forno? Don’t overcook the tortellini. To be safe, cook it according to package directions and drain. If you want to add a little salt and oil that will add to the flavor. Bacon. There are no rules. You can use any bacon. Olive Garden actually uses prosciutto filled tortellini. 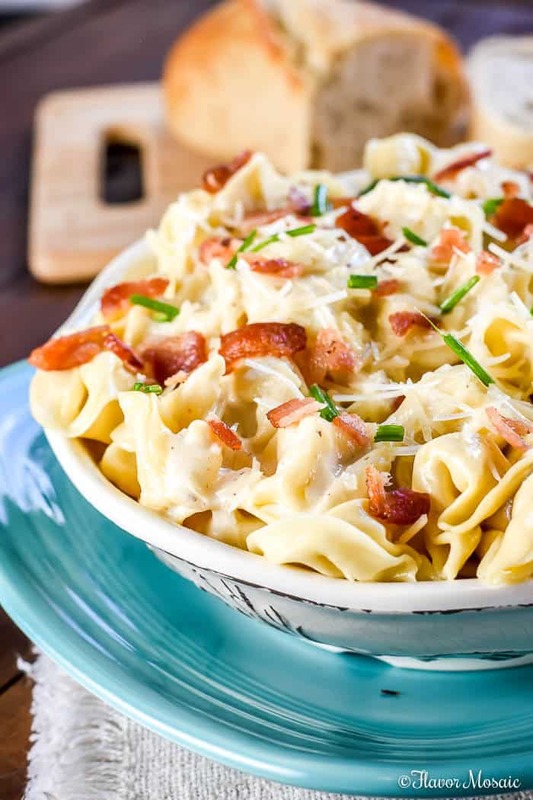 I did not have any so I used cheese tortellini and center-cut bacon from the grocery store. I personally like the leaner cut bacon, but it is up to you. You can use bacon bits but I think the real bacon adds more flavor to the sauce. The hardest part of this dish is probably making the sauce. It is like a bechamel sauce with bacon. The bacon and butter add the fat. Then add sprinkle in flour and stir. It is usually easier to add the flour a little at a time and constantly stir it in with the butter and bacon fat. It makes like a paste, and adding flour in a little at a time prevents getting big lumps of flour in the sauce. Make this Tortellini Al Forno and come back and leave a comment to let me know how you liked it. I just know you’re going to love it. My family did. 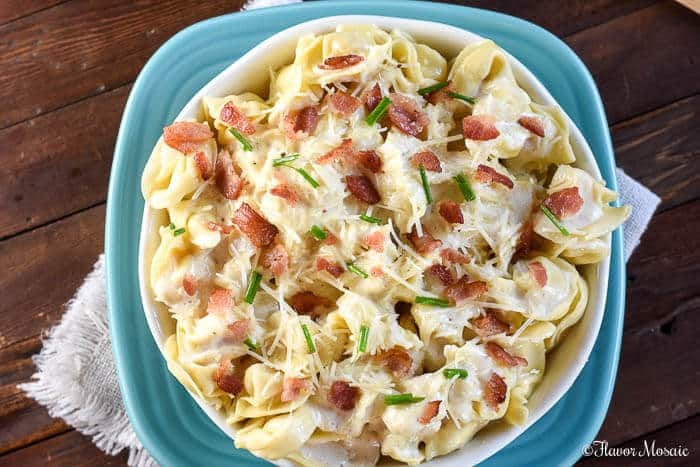 This Tortellini Al Forno, a copycat Olive Garden recipe, has pillowy cheese filled tortellini in a rich parmesan cream sauce topped with crumbled bacon and chives. Prepare the tortellini according to package directions. Rinse and drain. In a large skillet over medium heat cook the bacon. Remove onto a plate covered with paper towels. Drain all the bacon drippings except about 2 tablespoons. Add 2 tablespoons butter and allow to melt. Slowly add 3 Tablespoons of flour, a little at a time, while continuously stirring until it makes a thick paste. Break up any lumps of flour. Pour in the heavy cream and stir until it thickens. Remove from heat and add the parmesan cheese and stir. Pour the parmesan cream sauce over the cooked tortellini. 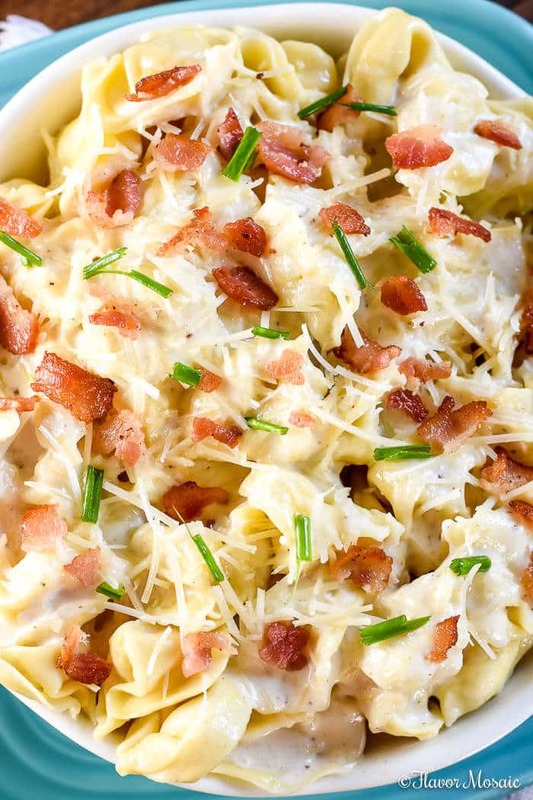 Top the Tortellini Al Forno with cooked chopped bacon and chopped chives. If you like this Copycat Olive Garden recipe, be sure to try my Copycat Olive Garden Chicken Scampi. Thank you! It is one of our favorite dishes. I love tortellini!! So comforting! Thank you. We think it is perfect too!